Meet Arthur He’s smart, shy, determined and… oh yes… he’s an owl. Arthur wants more than anything to go trick-or-treating, but can he make his dream a reality when the humans don’t even notice him? I write for children, so I try to tap into the natural curiosity and sense of wonder that characterizes childhood. My books are about straightforward problems, but I try to handle them in a way that is anything but simplistic. Most of all, I try to write characters that children can identify with, who yearn for things in ways we can all understand. Why did you write *this* story? What is compelling about it for you? Ironically, with this book, the cover came first. I was poking around on the internet and discovered this beautiful image of an owl sitting on a crooked wooden sign, with pumpkins and a bright turquoise background. They say a picture tells a thousand words, and to me, that picture demanded a story. Of course, the image that inspired the story looks somewhat different than what ended up on the cover. The owl on the actual cover image looks younger, more innocent, and more inquiring than the stodgy old fellow on the original image. I suppose I already do. In my books, hope conquers fear, friendship dispels loneliness, happy endings are a given, and mistakes can always be corrected. The real world isn’t always like that, but I try to create a microcosm for myself and my family where those principles hold true. What surprised you while writing it? Arthur. 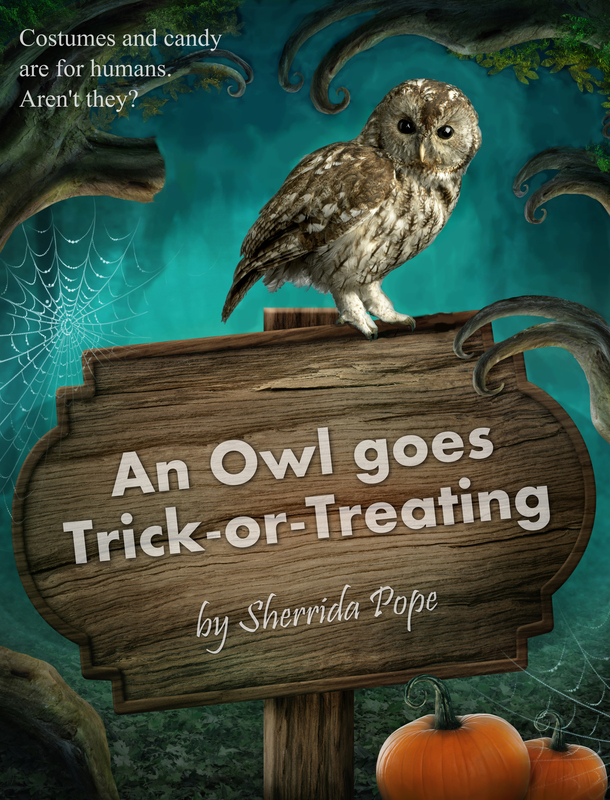 I mean, he’s this shy little spotted owl who barely dares leave his tree branch – and yet he ventures off into crazy neighborhood adventures because he’s simply so fascinated by the magic of Halloween. I didn’t expect that to happen. When I started jotting down the opening pages, I had no idea who Arthur was or what he wanted, except that he found Halloween costumes intriguing. He came to life on the page beautifully. I love the way his curiosity overcomes his shyness, and his determination overpowers his fear. I hope they’ll smile. I hope they’ll giggle at a couple of the messes Arthur gets into, and sigh with relief when he gets back out of them. I hope they’ll see Halloween, and their fellow humans, a bit differently than they did before reading the book. Was there anything you did deliberately while crafting this novel? Why? I focused a lot on language. I wanted the book to have a smooth, natural feel without using a lot of big words. So you’ll find a lot of images rendered in straight, simple prose. At the same time, I made a conscious decision not to avoid complex language completely. Arthur feels dejected at a point near the end of the book, so I went ahead and used the word ‘dejected’. Kids are smart enough to figure things out from context, so even when a word is outside a readers’ vocabulary, I’ll go ahead and use it if I feel it adds value to the story. I spent a lot of attention on the artwork, as well. I do my own interior pictures, and for this book I wanted to maintain the innocence and vulnerability of Arthur’s personality. I kept the drawings simple – which is usually a good choice for me because I am not a photorealistic artist. I tried to give each drawing a clear emotional context. I wanted Arthur’s experience to jump off the page, to become real in a way that words alone could not accomplish. Since the book’s only just been released, it’s too soon to say whether I succeeded. But my hope – my goal – was to create emotional resonance in my readers. Sherrida Pope lives and writes in the scenic area near Utah Lake. She has three children, a pet hedgehog, and a transient appreciation for classical music.